Some time ago, I bought the new WH40k starter pack, as the miniatures inside are spectacular. 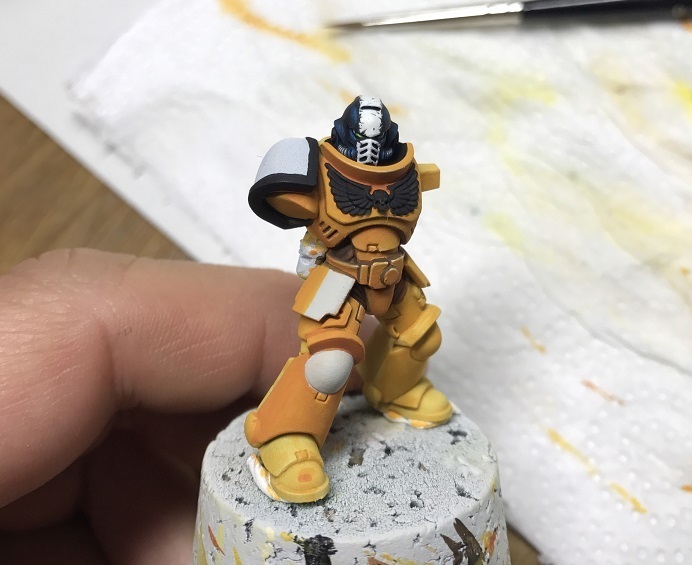 I decided to start painting with this fellow Primaris marine – which will be painted in pre-heresy Imperial Fists colours. I really enjoy working with yellow – the problem is that it is an extremely difficult color, as most paints consistency is quite bad. The general approach I have is to base on a solid white undercoat. And then work from light color to darker. One thing – if you over do with number of layers, be aware that you will loose saturation of the base color. A workaround is to apply on those area’s pure white and the re-apply a layer of lighter yellow. Highlights wer done by adding Sol Yellow to the mix, and then Linen White by Reaper Miniatures.